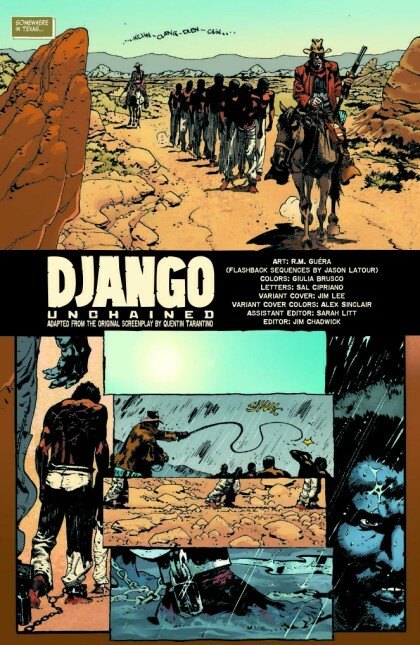 SETH’S PICK :: DJANGO UNCHAINED #1: December always brings lots of good comics, and this week is a good representation of that. Everything from Hickman’s Avengers #2 to Francavilla’s Black Beetle #0 will be new on the shelves, with lots of other good books like Saga and Pogo along for the ride. So why am I picking a movie adaptation? First off, in addition to being published by Vertigo, the comic’s script is essentially Quentin Tarantino’s screenplay. In fact, parts of the screenplay might not end up in the film, but will appear here, so that’s a plus for Tarantino fans. Most significantly to me are the artists bringing the comic to life. It’s the first major post-Scalped work from artist R.M. Guera, and each issue’s flashback sequences are provided by talented local writer/artist Jason Latour. So you have a Tarantino-helmed comic about a vengeful slave-turned-bounty hunter trying to free his wife, and you have more-than-qualified artists bringing the screenplay to life in a way the movie won’t. This is a no-brainer to me.